To get a really good cup of espresso you need a proper espresso machine, but most of us can't afford to have a professional-quality piece of equipment at home, and unfortunately, some of the espresso machines made for home use turn out really inferior coffee. 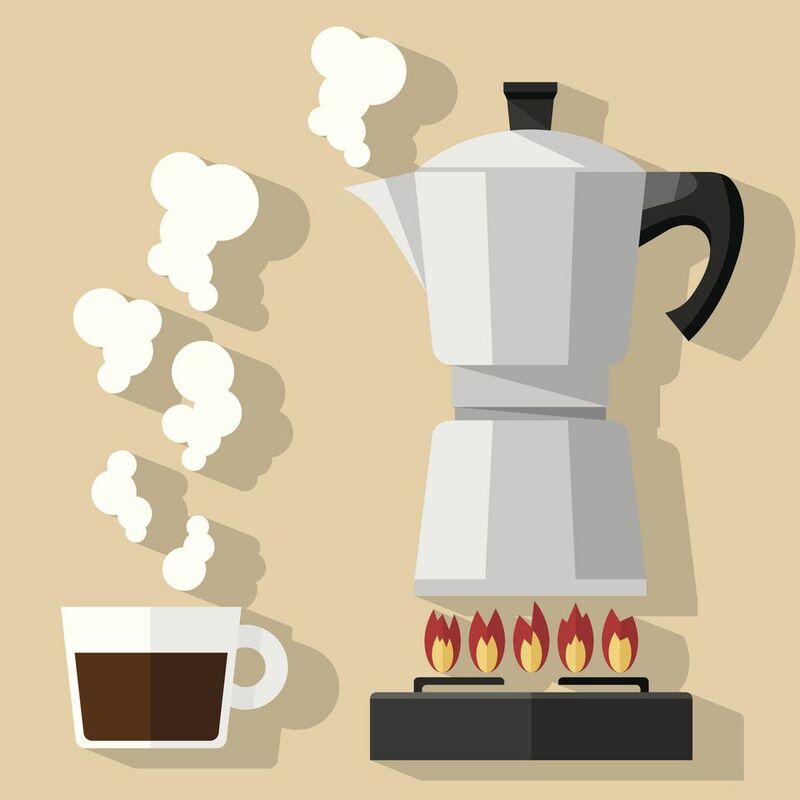 Most Italians, however, make their morning espresso with a stovetop coffeemaker called a moka, first produced by the Bialetti company in 1933. These stovetop kettles use steam pressure to force water up through coffee grounds and into a separate serving chamber. They are inexpensive, lightweight, easy to use, and quickly turn out a great cup of coffee in just a few minutes. Keep in mind that this type of pot works best with a gas stovetop; the aluminum pots don't work on induction stoves and an electric burner is too difficult to regulate. Technically, it is not the same as espresso, as it is made using a much lower pressure than a professional espresso machine, but if you use a good-quality coffee at the proper grind for moka pots (which is a medium grind, not as fine as for an espresso machine), it will produce quite good results, even with a bit of crema on top—the coveted layer of light foam on top of a well-made cup of espresso. In just a few basic steps you can have a hot cup of rich espresso in about 10 minutes. Unscrew the top half of the moka pot, remove the filter basket, and fill the lower section with water just to the level of the bottom of the round safety valve (you should be able to see this inside of the water chamber). Replace the filter basket on top of the bottom half of the pot. Fill the filter basket with medium-grind coffee. The coffee should be level with the top of the filter. You can gently pat it with the back of a spoon or your fingers to make the surface level, but do not tamp it down tightly (that would create too much pressure and could cause hot coffee to spray everywhere). Run the tip of a finger around the edge of the filter basket to remove any stray coffee grinds so that you'll be able to screw on the top half without any obstructions. Screw the upper section on tightly, making sure it is straight. Set it on the stove, over a brisk flame that is not larger than the diameter of the bottom of the pot. If you do not have a small-enough burner, you might need to use a stovetop heat diffuser to tame the flame. As soon as coffee begins to emerge (you will hear it starting to gurgle and bubble out), turn off the flame and let the rest of the coffee slowly percolate through. The coffee is done when the upper section is full and just steam emerges from the spout. The type of coffee you purchase and the size of the grinds are very important when using a moka pot to make espresso. You must use coffee that's specifically roasted for making espresso and is a medium grind. Standard American/Northern European drip coffee (even "espresso blends") won't work because they are not ground to the proper consistency and contain too many bitter oils. A good coffee to try is Illy medium-grind espresso, which is designed for use in moka pots. It comes in silver-and-red cylinders and is also sold as whole beans that you can grind yourself. To make a caffè macchiato (espresso shot with a touch of foamed milk) or a cappuccino out of the coffee from your moka pot, use a milk-foaming mug by Frabosk. They make both ceramic versions (for use in a microwave) or metal ones (for stovetop use). You simply heat the milk (for about 45 seconds in the ceramic version, and over low heat just until the milk is hot in the stovetop version) and then pump the milk-foaming attachment vigorously for about 20 seconds until it forms a thick and velvety foam. Give the bottom of the mug a sharp tap on the counter to break up any larger bubbles, and then let it sit for 1 minute before adding it to the coffee to let the foam grow denser and smoother. You can also use a French-press coffee maker to foam milk in the same way.